The ferry route from Athens to Amorgos is one of the most famous, especially during summer. Thanks to that, there are many different itineraries connecting Athens with Amorgos and travelers have plenty of options to find the most convenient for them. 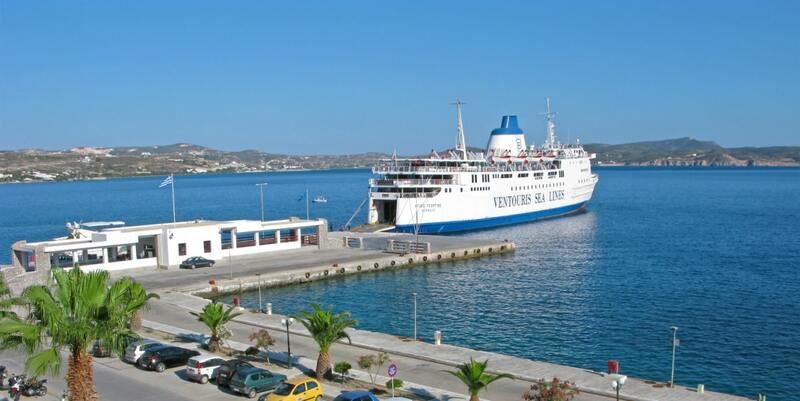 There is at least one ferry per day departing from Athens (port of Piraeus) to Amorgos. The trip is one of the longest and usually lasts from 7.40 to 9.20 hours. The departure time from Athens is usually 17:30, during low season. During high season, the departures are earlier and there is also one more option of catching a morning ferry (departure from Piraeus around 6 am). An average ticket price goes from € 20 to € 60, but as this is usually an overnight and long trip, you should consider the option of booking a cabin with beds. The prices of Cabins range from € 60 to €85 (depending on the ferry operator and the type of cabin -single cabin or four bed cabin). At which port am I arriving in Amorgos? Departures from Athens to Amorgos are normally from the Port of Piraeus . During summer, some years, there are ferries that depart from the Port of Rafina in Athens and arrive to Amorgos. Amorgos is a very long island with two ports : Katapola on the North and Aegiali at the South. During the low season, there are no ferry trips from the Port of Rafina in Athens, the ferries depart from the port of Piraeus. Normally, the ferries depart from Athens (Piraeus) and arrive at the port of Aegiali in the island of Amorgos every Monday, Wednesday, Thursday and Saturday. During high season the itineraries are denser, and you can find ferries almost every day. New itineraries are announced every year and every season, so be sure to check our search engine for all available ferry routes between Athens and the port of Aegiali. Aegiali is a beautiful village in Amorgos with great sandy beaches and amazing beach bars. It is further from Chora than Katapola and there are many departures during summer to nearby islands like Donousa, Irakleia, Koufonisia, Schinousa and Astypalaia. Usually, there are ferries connecting Athens to Katapola Tuesdays, Fridays and Sundays. During the high season, on the other hand, there are departures from the Port of Piraeus and arrivals at the Port of Katapola almost every day of the week. Keep in mind that during low season it is rare to find departures on a Saturday from Athens to Katapola. Katapola is a small village close to Chora and the port is connected with many itineraries during the high season, to nearby islands like Koufonisia, Naxos, Paros, Donousa, Schinousa, Irakleia and Astypalaia. What is the trip duration from Athens to Amorgos? Athens is about 320 km from Amorgos and usually the ferry trips last between 7h40 and 9h20. The distance between Athens and Amorgos is therefore quite long, but if you are in a hurry, you can always take a high speed ferry! What ferry to choose from Athens to Amorgos? As most of the journeys from Athens to Amorgos are overnight trips, we suggest you book a ferry that has cabin beds as an option (such as with the Blue Star Ferries company for example). For this journey you can choose between the single cabin or the four-bed cabin options, with different prices depending on the company. You can compare the ferry prices of different cabins on ferryhopper.com. On such long journeys, it is advisable to travel with a cabin. In order to do so, you should book your tickets as far in advance as possible (3-4 months before the trip). Ferry rides can become a bit bumpy during summer if the wind picks up. There is nothing to worry about, as ferries do not operate if conditions are dangerous. If you are prone to seasickness, try to choose the largest possible ferry as these are the most stable. In our pages, you can find useful travel information about Amorgos. The port of Piraeus gets really crowded during the high season. Make sure to arrive there at least one hour prior to your scheduled departure. Remember that there are two ports in Amorgos, the port of Katapola and the port of Aegiali. Be sure to know which port you are departing from and which you are arriving at. This should be clearly marked on your ticket, or you can check our FAQ. The two ports of Amorgos (Katapola and Aegiali) are about half an hour away from each other by car. Keep in mind, though, that the road is windy and you could easily eend up behind a herd of goats, so give yourself some time! It is really rare to find departures on Saturdays during the low season from Athens to Amorgos, so be careful while planning your trip. Both ports of Amorgos are connected with frequent ferries to islands, such as Naxos, Paros, Koufonisia, Schinousa, Donousa, Irakleia and Astypalaia.